This modification has been done by three extremely talented customizers at Katros Garage in Indonesia. 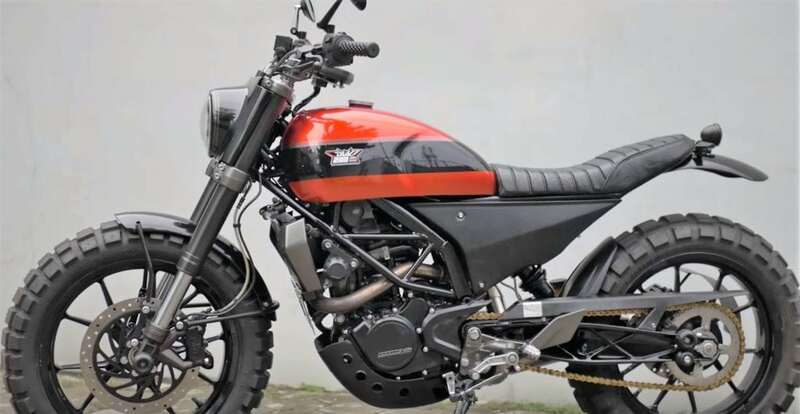 The custom modification team has used a stock KTM Duke 200 and turned it into a scrambler. The motorcycle looks completely different from the Duke 200 and surely will attract everyone’s attention. From what it looks like the custom motorcycle builder hasn’t messed too much with the frame of the motorcycle but the rear fender looks slightly more high set than the standard Duke 200. As far as other changes are concerned the custom motorcycle has been fitted with a new fuel tank. There is a new badge as well on the tank which replaces all the additional sticker work that we find in the Duke 200. The stock headlamp units of the motorcycle have also been replaced with a new round shaped LED headlamp unit while the tail lamps too have also been replaced with a new aftermarket LED unit. The motorcycle also gets custom side panels. Both the front and rear alloy wheel remain stock but they receive a complete black treatment on them. The wheels get wrapped with new dual-purpose tires with bigger threads. The motorcycle also has been fitted with a flatter custom seat which helps give the Scrambler look to the motorcycle. Lastly, it also gets a fresh new coat of paint on it, the fuel tank, in particular, has been painted in metallic red which actually matches well with the matte black color used on the rest of the motorcycle. Katros Garage has also used a Black stripe which runs through the side of the fuel tank. There has been no mention whether the custom bike builders have made any changes to the engine or not. The stock KTM Duke 200 is powered by a 200 cc single cylinder motor which produces around 25 PS peak power at 10,000rpm and 19.2 Nm torque at 8,000 rpm. The engine is mated to a 6-speed gearbox. KTM has recently updated the Duke 200 with ABS in India. The ABS equipped variant is priced at Rs. 1.6 Lakhs (ex-showroom).